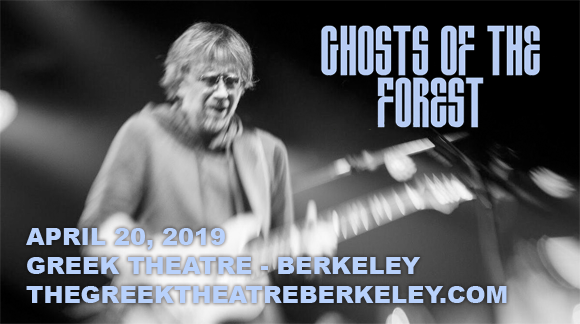 Phish frontman Trey Anastasio brings his brand new band, Ghosts of the Forest, to Greek Theatre Berkeley on Saturday 20th April 2019! Combining the talents of Anastasio and Phish drummer Jon Fishman with vocalist Jennifer Hartswick, guitarist Celisse Henderson, bassist Tony Markellis, and keyboardist Ray Paczkowski, Ghost of the Forest are an exciting new venture and will be supported for the evening by "Thai-funk" trio Khruangbin! American musician, singer, songwriter, and composer Trey Anastasio is best known as lead vocalist, guitarist and co-founder of the rock band Phish. He also has a successful solo career, having released 11 solo studio albums, and has served as the frontman of American alt-funk supergroup Oysterhead and free jazz ensemble Surrender The Air. Anastasio has also performed with several symphony orchestras as part of his "Evenings with Trey Anastasio" series, and has played with the Phish-related projects Bivouac Jaun, Bad Hat, Phil Lesh and Friends, and SerialPods. Ghosts of the Forest is a side project of Anastasio and fellow Phish co-founder Jon Fishman, and also features vocalist Jennifer Hartswick, guitarist Celisse Henderson, bassist Tony Markellis, and keyboardist Ray Paczkowski.